Grantham residents and Law Enforcement Officials gathered last evening to say thank-you to retiring Police Chief Walter A Madore. Madore will finish his 27 years in law enforcement at the end of his shift today (Friday July 7). Madore joined the Grantham Police Department as a part-time officer in January 1990. In 2005, he graduated from the 136th NH Police Academy and became a full-time officer. He was appointed as Police Chief in 2008 after serving in the roles of Captain and Deputy Chief. 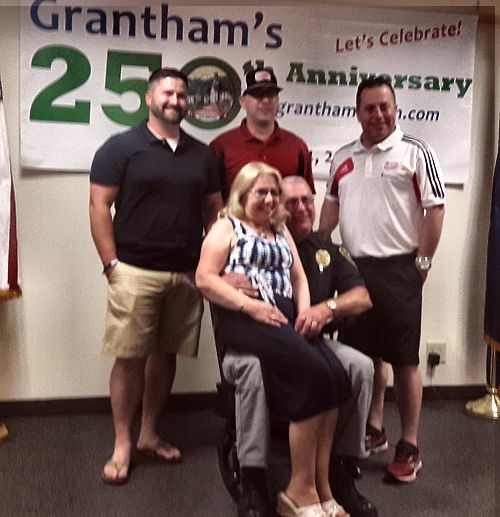 He was presented with a plaque with a past and present Grantham Police Patch, his badge from Grantham and his badge from the NH Chiefs of Police, in addition to a rocking chair and a gift certificate for years of golf at Eastman Golf Course. The New Hampshire Department of Environmental Services and the New Hampshire Rivers Management Advisory Committee is holding a public hearing at the Warner Town Hall on July 11th. The hearing is to gauge community interest in having the river accepted into the state’s Rivers Management and Protection Program. The meeting is for Hopkinton, Warner, Webster, Sutton and Bradford residents, but anyone interested in the river’s welfare is urged to attend. The Newport Highway Department will be replacing culverts on Bradford Road west of the East Mountain Road intersection. The project will start on July 10th and go through July 13th. Bradford Road will be closed to through traffic between 7:00AM and 5:00PM. It is suggested alternate be taken to avoid the construction. Vermont Seeking Federal Aid for Recent Storms. Vermont is seeking federal help for five counties impacted by last weekend storms. On Thursday, Vermont Emergency Management (VEM) Director Erica Bornemann asked the Federal Emergency Management Agency (FEMA) to conduct a preliminary damage assessment for Addison, Caledonia, Orange, Rutland, and Windsor counties. FEMA needs to verify Vermont’s estimates as a first step to determine if the state qualifies for aid. More than $2-million in damage to public infrastructure has been verified by the state, and the cost of more damage is still to be officially tallied. If Vermont is eligible, communities could receive 75 percent reimbursement for response and recovery costs. Those costs include repairs to local roads, public buildings, other municipal assets, and certain costs related to response.